As promised on Friday, today we are starting our exPress-o gift guide series with a bunch of gift guides for all budgets, tons of different interests, sass factors, coolness and niftiness. Some will be dashing and a bit quirky, while others will be heart-warming and sweet. I hope you will find 'that something special' for every single friend and family member, since there is nothing better than the feeling when someone you love opens a gift you chose and their face lights up. Priceless! So we're staring off with 10 takes on soothing and comforting honey. I haven't yet met a person who didn't like honey or honey scented products, so those gems are a safe and special buy for moms who love honey teas, sisters who smell like honey soap or a sweet co-worker in need of a little relaxing treat. 1. Lukan's Farm honeycomb ($ 26), 2. Tiny bee ring ($30), 3. Honeycomb stick ($13), 4. 2015 honey bee wall calendar ($18), 5. 100% raw honey pack made of New York Basswood honey, Oregon maple honey, Meadowfoam honey and Washington buckwheat honey ($15-$55), 6.Manuka honey soap ($3), 7. Teak honey jar ($38), 8. Milk and Honey bath fizzy ($6), 9. Bee hair pin ($17), 10. Honey lip balm ($5). Bonus gift: the ultimate honey lover gift: a hive + honeybees aka full honey keepers gear ($450). P.S: Also, here are six 2010 gift guides, five 2011 gift guides, seven 2012 gift guides and nine 2013 gift guides. You read my mind, while growing up my mom always told us that honey is the best remedy for everything. I'm getting her a few of those items. Love all of these! 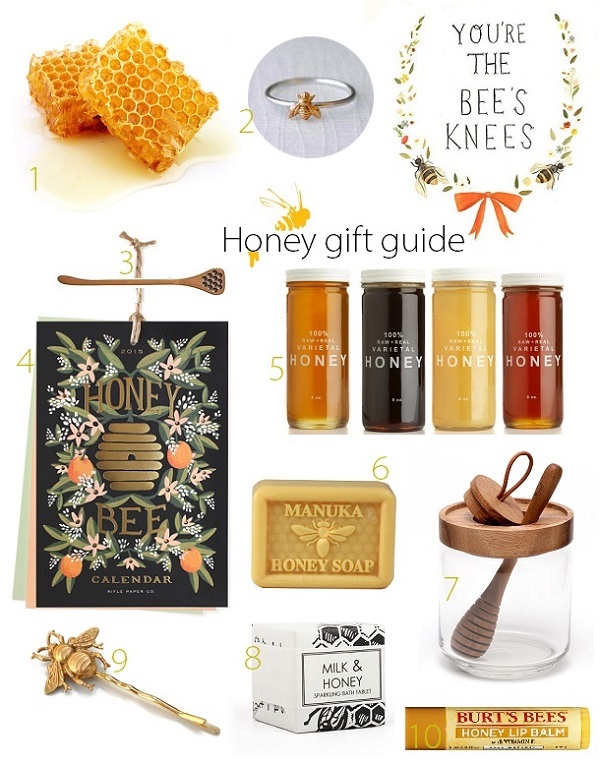 I'd love to gift (or receive) that raw honey pack. Btw, have you seen this? http://www.gardenista.com/posts/the-bees-of-buckingham-palace Thought of you! It's adorable, isn't it, Jillian? So happy you like it, Steph and thanks SO much for that link. You totally made my day with it...What a gem and I had no idea that something so incredible can be hidden on the roof of London's Fortnum and Mason. I so want to see it person, don't you?